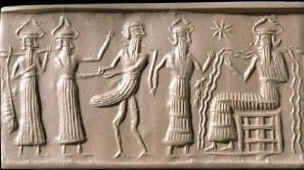 On the Sumerian relief created before the Flood, you see a genetic hybrid: a man - bird Anzu brought to Enki (is in water) for suspicion in stealing some relic. Anzu is not Naga and not an angel-human hybrid, who occupy managing posts. He is a messenger and was created by artificial mixing of genes of a bird and a man, especially for the task of a messenger. 23.01.2001 the House of Lords of Great Britain legalized human embryo cloning for researches. In the accepted document it is told that embryos should be destroyed after 14 days, and the creation of children through cloning will remain outside the law. In the USA similar bill is accepted. In Japan, according the message of АВС News for 1.12.01, for mixing of the human ovule with sperm of an animal even the criminal punishment with deprivation of freedom till 10 years is stipulated. But can it stop dishonest scientists from further fatal experiments? Can a government check the activity of all private genetic laboratories? Can we be sure that embryos for experiments will be destroyed in due time? Of course not. We have come to the line, to where before us probably the old world before the Flood approached first. Those people, having extensive knowledge given them by the fallen angels, probably, together with them began to interfere in God’s creation - human genetics. Today we stand on a threshold of Great Anger of God. The inhabitants of the inferno desperately want us to believe that they are the superior race which arrived from the other galaxy. If since 1940 they in the image of aliens did not advertise their apparition to people, today they are obviously interested that the majority of people did not doubt of their existence. During the last years they leave us "autographs" - «Crop Circles», sometimes absolutely ruining the farmers. On website http://www.cropcircleconnector.com you will see, how many of their arts they have left only in 2002!